Win a Family Four Pack of Tickets to Clementon Park! How would you like to have a blast with your family at Clementon Park on Monday August 15, 2011? Here’s your chance! Delco Deal Diva has teamed up with BEN-FM and Real Mom in the Media to offer you a four pack of tickets to Clementon Park in Clementon, NJ on Monday August 15, 2011. Dora the Explorer and Sixers’ World B Free will also be making an appearance from 10a-Noon. I know my daughter is going to flip when she sees Dora! Clementon Park has something for everyone. It is perfect for bringing along the whole family! 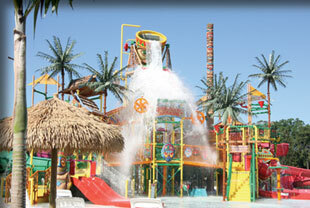 Together you can experience the fun of their wide variety of water park attractions, thrill rides and family rides. Of course we all love a good deal, so keep in mind that Every Monday in August, admission to Clementon Park is just $10 when you enter the park before 11am (tickets usually run from $19.99 – $37.99). Mandatory: Tell me why you and your family would like to spend the day at Clementon Park. •Tweet the giveaway on Twitter (leave me a link to your tweet) Be sure to include @DelcoDealDiva in your post. Leave a seperate comment for each entry; be sure to leave your email address so I may contact you if you are the winner. Winner will be drawn via random.org on Friday August 12th at 6:00PM. Winner will be notified by email and will have 24 hours to respond. In the case that the winner does not respond within 24 hours, an alternate winner will be drawn. Tickets are valid on Monday, August 15, 2011 ONLY. Winner will be responsible for their own transportation and parking fees. Disclosure: This ticket giveaway for Clementon Park has been sponsored by BEN FM and Real Mom in the Media. I did not receive compensation for this post. I was provided with tickets to attend Clementon Park and tickets to host this giveaway. Opinions are solely my own. We are having a stay-cation next week and can’t really do much financially right now. My kids would LOVE to go to an amusement park for the first time. i want to win because i would love to take my 2 daughters. and my husband too. it looks like lots of funa nd a fun family day. Haha! I was thinking it was Friday. Disregard the “late” comment. Heather…it’s no problem! To post a link to a tweet, you look at the tweet you sent. Under the tweet is a time (3 hrs ago, etc)…click onto that time and the link will open in its own page. Copy and paste the link at the top of the page. I can’t believe I won!!! Thank you so much! Looking forward to a day filled with fun! Thanks again…I’m truly appreciative!